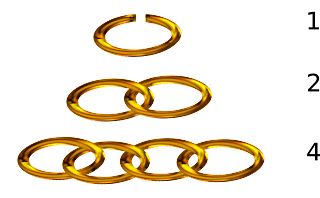 Maths at:: Answer to "Seven Gold Rings"
Tom employs a labourer, who is going to work for him for seven days. Every day the labourer wants to be paid one gold ring for each day they have worked. So at the end of the week they should leave with seven gold rings. 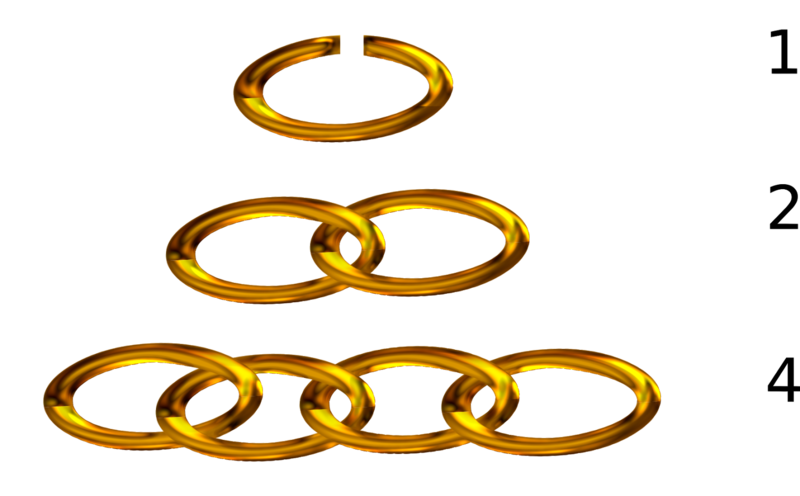 Tom has a chain with seven gold links, but cannot simply give the laborourer all seven links, because the labourer wouldn't return. Equally, the labourer wants to ensure that they leave every day with as many gold links as days that they've worked, otherwise, they, again, won't return. Tom could cut each link and pay the labourer one link per day, using seven cuts. But this wastes a lot of gold. What is the minimum number of links that Tom must cut in order to make sure the labourer can always leave with the correct number of gold links? Cut only the fifth ring. and rearrange to form the binary sequence 1, 2 and 4 links. Using these links we can pay the labourer the exact amount everyday, on the understanding that we can take back the links we've already given them. Day 7: give the 1 link piece. Thus, at the end of the seven days the labourer has all seven links and was never short-changed! Consider the extension to this problem. Tom wants the labourer to work for 15 days and has a chain of 15 gold links. What is the minimum number of cuts would he need to do now?